Hubzilla may be the only place where "Hello hubbies" is a totally gender neutral salutation. https://upload.wikimedia.org/wikipedia/commons/0/03/Giant_Teletubby_Invades_DC.jpg Because Hubzilla it's fun . I haven't seen anyone shooting Olympus for awhile, but the m5 ii looks like a good camera. That's not mirrorless right? That's the f/2.8 lens? At first, excuse my bad English please. This Cam is mirrorless, my second mirrorless Olympus. I have the first E-M5 also in use. The Cams are okay for me. If I dismanle the handle and the second batteryhandle and use one of my Pancakes, I can put it in my jacket pocket. And yes, its the 40-150mm f2.8 with the 1.4 Teleadapter (56-210mm by f4.0). Its a fine lens. My best in mFT. 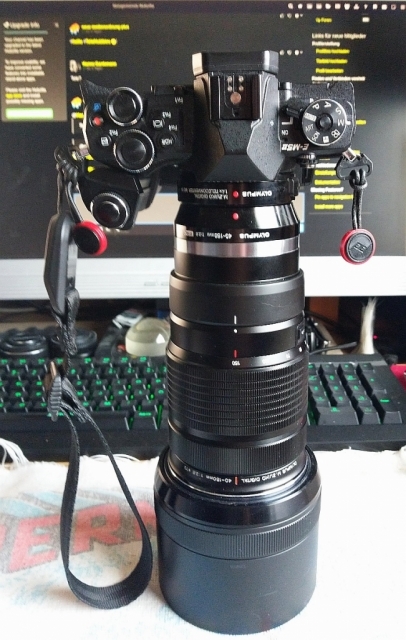 This configuration, camera, handle, battery handle, adapter and lens weighs only 1.75 kg.